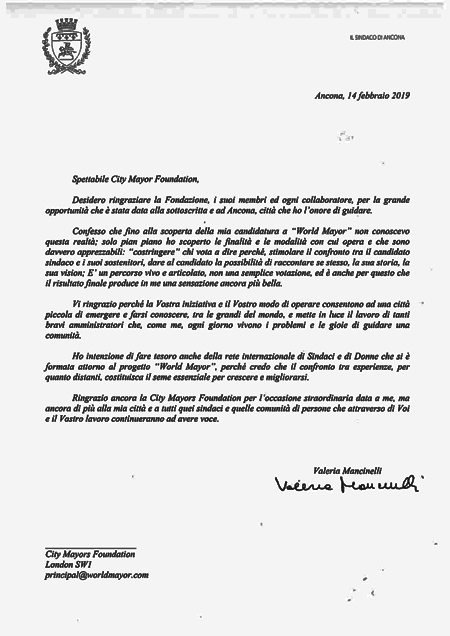 We publish below Mayor Valeria Mancinelli’s gracious and eloquent letter which she sent after she was informed that she had been awarded the 2018 World Mayor Prize. 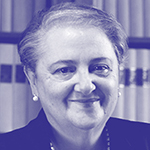 I would like to thank the Foundation, its members and each contributor, for the great opportunity that has been given to me and to Ancona, the city that I have the honour to lead. I admit that before my nomination for World Mayor, I didn’t know about your organisation. Only now, step by step, I’ve discovered more about your aim and the way you work: “obliging” those who vote to give a reason, encouraging discussion between the nominated mayors and their supporters, giving candidates the opportunity to talk about themselves, about their story and their vision - this is truly remarkable. It is an active and well-structured process, not just a simple vote, and it is also for this reason that the final result gives me an even better feeling. I would like to thank you because your initiative and ways of working allow a small city to emerge and become known, amongst its bigger counterparts in the world. You highlight the work of many good mayors who, like myself, experience every day the joys and challenges of leading a community. I intend to treasure the international network of Women Mayors that has been created alongside the World Mayor Project, because I believe that sharing experiences, no matter how far away we are from each other, is the essential seed for our growth and improvement. I would like to thank not only the City Mayors Foundation again for this extraordinary opportunity that has been given to me, but also my city and all those mayors and communities of people that, through you and your work, will continue to have a voice.